This edition of the EyeCarePD newsletter is about a new, and much-needed term to describe intraretinal fluid in patients with dry and wet age-related macular degeneration. There just isn’t enough information out there when it comes to OCT terminology for intraretinal fluid—specifically, for the purpose of lesion classification in chorioretinal pathologies. 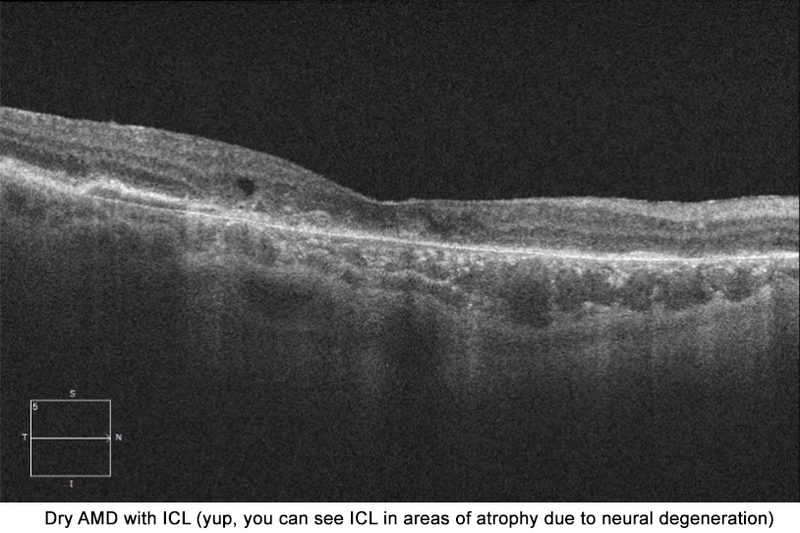 The good news is that a recent publication tackled this topic, and the authors revisited a new term: “intraretinal cystoid lesions” (ICL). This term describes intraretinal ovoid hyporeflective spaces noted on OCT evaluations in patients with age-related macular degeneration (AMD). Of course, other pathologies can also have cystoid lesions, which can take on varying characteristics. We’ll continue discussing this interesting topic in other newsletters and posts. In the meantime, check out the EyeCarePD Glossary for more examples. Tip: Use the phrase “intraretinal cystoid lesions” (or “ICL” for short) when documenting hyporeflective ovoid spaces on the OCTs of your patients with AMD.